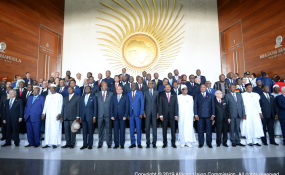 Heads of State and Government of the 55 African countries in the African Union begin the organisation's 32nd ordinary session in Addis Ababa. The Egyptian president will work with South Africa's Cyril Ramaphosa as the first vice-chairman and the DR Congo' Felix Tshisekedi as the second vice-man. The theme for this year's summit was; Refugees, Returnees and the Internally Displaced Persons: Towards Durable Solutions to Forced Displacement in Africa. Earlier, the AU Commission Chairman, Chad's Moussa Faki Mahamat had commended President Kagame's stewardship of the AU, saying the continent had learnt a lot from his tenure. Dr Mahamat said President Kagame had enhanced the AU's progress towards autonomy and accountability. "Africa's generosity to those in need is unmatched,'' said the UN chief.